, I was commissioned to create an art installation that explores the intersection of design, education & technology. All art direction, UX/UI design, computer vision and visuals programming were done by myself, with additional help from Rachel Nhan (graphic design), Jessie Contour (3D modeling) and Owen Herterich (Front End mobile site). For this installation, I wanted to create an engaging way for the Teachers College community to share and store their collective experience. 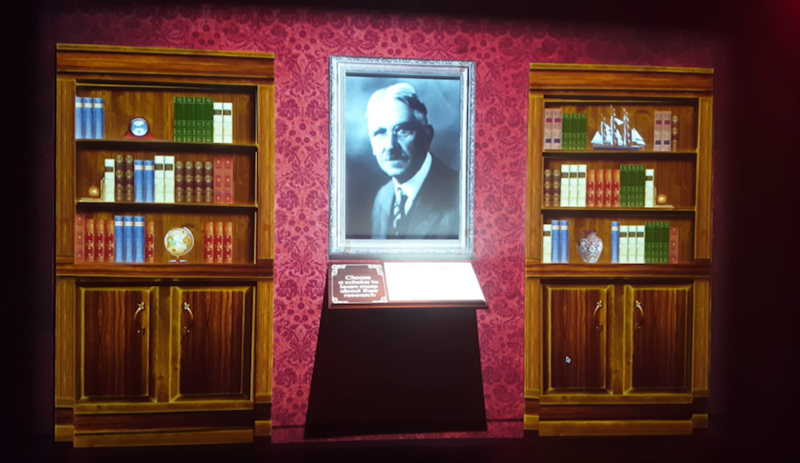 "Collective Wisdom" is an interactive, projection-mapped library inspired by the beautiful libraries of the Victorian Era. Both new and old, the installation reflects Columbia University's commitment to cutting edge methods and technologies while paying homage and respect to it's 250 year old history of academic excellence. The library was 30% pre-populated with bits of wisdom, i.e. books, from notable scholars in the field of education. The remaining 70% of the library's capacity is left open for users to contribute their own content through a mobile-friendly, front-end site. After receiving a new bit of wisdom, a book materializes with the contributing user's name and message. All books within library fall in one of ten different categories, curated by the EdLab team. Each book contains a link to reveal other books in the same category with a flourish of ribbons gliding across the library. From the central desk, users can choose to reveal different categories or find works from 10 different scholars, each of which have image and biography content located within the portrait frame. All color and texture is projected onto a flat white wall with wooden facades to give an added sense of depth to the bookcases and portrait frame. All textures change with a flourish through different types of events events. 20 wallpaper textures, 14 bookcases, 10 portrait frames and 5 book covers allow for thousands of different possible room combinations. Three Orbbec Astra depth cameras allow touch detection in three interaction areas: two bookcases and the central desk. For detection of the bookshelves on the walls, a bilinear mapping of touches 5-6 inches off the wall turns the bookcases into a touchscreen. For detection over the desk, the depth camera is positioned overhead and detects touches through intelligent background subtraction of the area. This project is still being documented, but please enjoy the following media documenting the animation and touch detection. Test of texture flourishes, book interaction and category linking procedural animations. Test of wall touch detection using bilinear mapping technique of depth camera data.